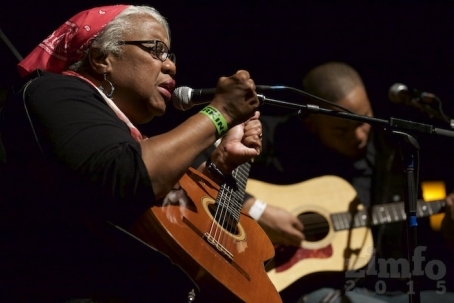 The last time Madisen Ward & the Mama Bear took the main stage at The Midland, they were opening up for B.B. King in one of his final performances. At this point, last October, the mother/son duo was just being introduced to listeners not just around the country, but in their hometown as well. They had recently been signed to Glassnote Records after wowing a roomful of record executives in Muscle Shoals and playing a secret showcase at Third Man Records in Nashville during the Americana Music Festival. Not long before that, Ruth and Madisen Ward were playing to small but enthusiastic audiences in and around their hometown of Independence. Ruth has been a musician for most of her life, playing the Midwestern circuit as a folk songwriter in the early ‘70s. She returned to music after her three children had grown, and her youngest son Madisen began accompanying her to coffeehouse gigs, sometimes joining her for a few songs. Like his mother, Madisen began writing songs as a teenager, finding his footing as a musician while accompanying Ruth on these shows. “The style we play is different than what my mom was playing in the ‘70s, and I came to music later, so I see it differently,” says Madisen, who has since fallen into the role of chief songwriter. “Eventually, my mom gave me the reins and told me to write.” While Madisen constructs a song's general melody and lyrics, his mom helps with song development, bridges, and harmonies. The two have found major success with this formula, creating a unique, moving brand of Americana music. All of this is why their performance this Thursday is a bit of a homecoming. This will be Madisen Ward & the Mama Bear’s first major headlining show in Kansas City, after a slew of achievements that include appearances on The Late Show with David Letterman and Later... With Jools Holland; opening slots for a broad scope of acts like The Pixies, Rodrigo y Gabriela, and The Tallest Man on Earth; and prestigious spots at events like Bonnaroo and Newport Folk Fest. They’ll also be bringing a full band with them this time, with Kansas City musicians Tom Hudson on drums and Brent Kastler on bass, as well as Larissa Maestro on cello. On the flip side, the two have found that success has great rewards. “The whole thing is the people,” says Madisen. “It’s a very personable career that really revolves around human interaction, and the energy of a room. All of these different people we get to meet have different stories.” Stories, perhaps, that will find their way into the duo’s music one day. 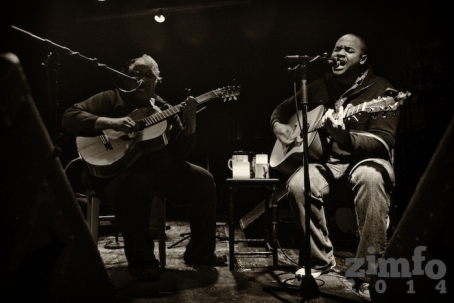 Madisen Ward & the Mama Bear will be playing at Arvest Bank Theatre at The Midland with special guests Luluc, an Australian folk duo, on Thursday night. Tickets are $15 and can be purchased here. 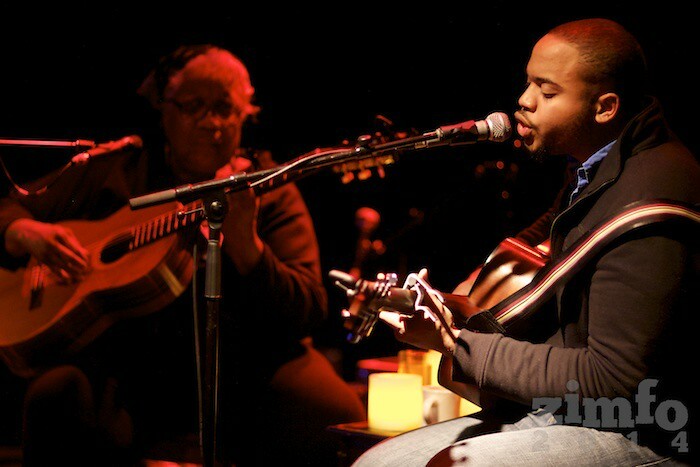 Last night, Madisen Ward and his mother Ruth turned down the lights at recordBar to play their songs to around 50 friends, relatives, and members of the KC music community. A few short months ago, an intimate dinner performance to a moderate crowd would have been the norm for Madisen Ward & the Mama Bear. Now, one of the best-kept musical secrets in the region is being recognized around the country; last night’s performance was unannounced and mostly by invitation. It was the duo’s first Kansas City show since opening up for B.B. King at The Midland on October 1. The two performed about 45 minutes of new and existing material; according to Madisen, the final song of the evening, "Little Barrel," was just written last Friday. This set captured every aspect of why MW&MB has become the object of so many musical affections. Madisen Ward can write tunes that sound more seasoned than someone of his age should be able to do. Along with it, his vocal styling demands attention, ranging from serenely soulful to ardent and impassioned. 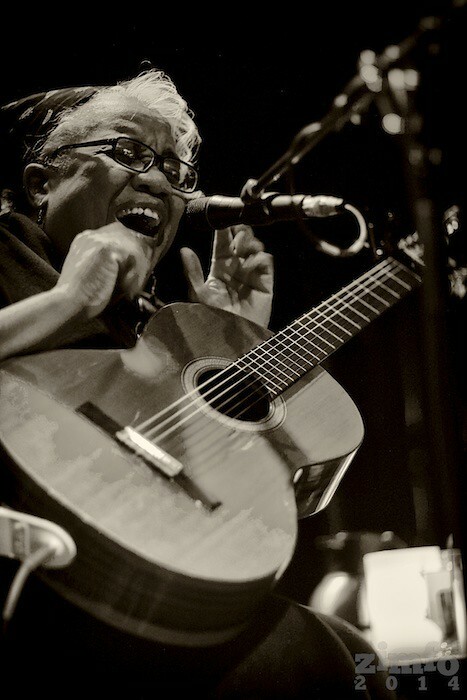 Ruth Ward plays guitar effortlessly, as though it’s an extension of herself, and sings each note from deep within. The connection they share—both musically and as mother and son—comes through with the genuine delivery of each song. 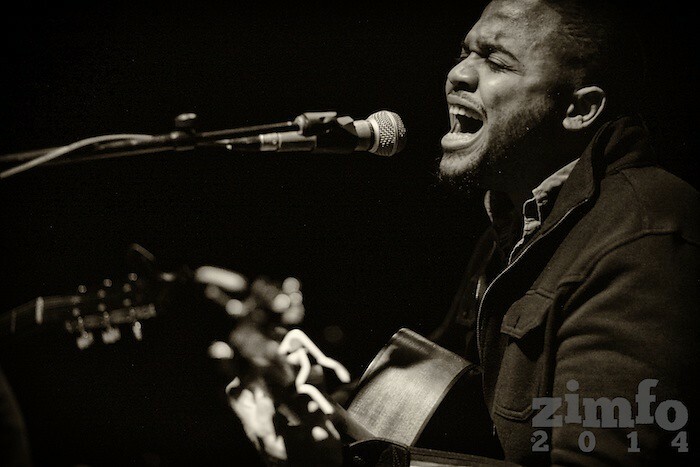 Madisen Ward & the Mama Bear were recently signed to Glassnote Records, adding their name to a professional caliber that includes Phoenix, Two Door Cinema Club, and Childish Gambino. 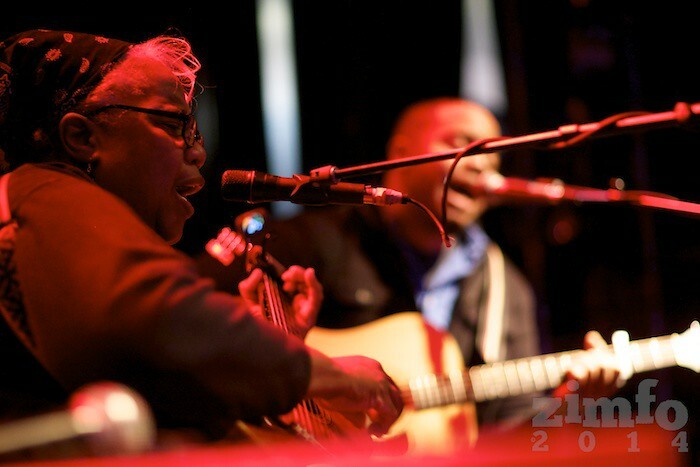 The duo attracted attention from the likes of Rolling Stone, Paste, and NPR after playing an exclusive showcase at Third Man Records for the Americana Music Fest in September, only a couple weeks after performing to a capacity crowd at Crossroads Music Fest in Kansas City. They plan to record and release an album with Glassnote in 2015. For more photos from last night’s performance, visit Zimmer’s Flickr album. Michelle is editor of The Deli KC, a staff member for Midwest Music Foundation and Folk Alliance International, and plays in The Philistines, Dolls on Fire, and Drew Black & Dirty Electric.